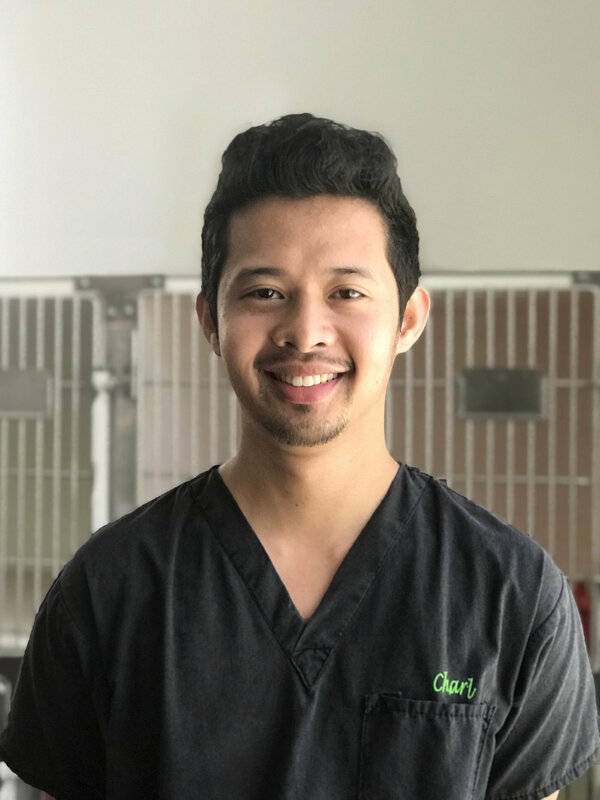 Dr. Malcolm is a truly internationally experienced veterinary surgeon, having worked in the UK and Hong Kong before moving out to Dubai in 2004. As a Bristol graduate, he also had the opportunity to study in Canada. He has a specialty qualification in Small Animal Medicine from the Australian College of Veterinary Scientists, and also does most of the surgery on the small exotic mammals! Dr. Malcolm is well versed with both primary and second opinion consultations. Having nursed his own pets through heart failure, thyroid illnesses, Cushing's and kidney disease, he has a specific and practical interest in these disease processes. He has completed post graduate radiography, imaging and medicine courses, and attended the International Feline Medicine conference for a week in 2013. When not practicing, Dr. Malcolm enjoys triathlon and has completed four Ironman races and many marathons. He is the proud owner of a mini zoo, with 2 rescue Salukis, and a Standard Poodle who came with him from the UK, 4 rescue cats and a foundling hedgehog! Dr. Monique is a Queensland graduate from way back in the 90's! She has a specialty membership in Small Animal Medicine from the Australian College of Veterinary Scientists and spends most of her time in the operating theatre. She is very experienced in both orthopedic and soft tissue surgery and has a keen interest in eye procedures. Her 2015 goal is to re-establish the Feline Friendly Cat clinic again and make every vet visit as stress-free as possible for both cats and dogs. When not at work, Dr. Monique doubles as an endurance athlete and competes in both marathons and Ironman races. Her goal is to beat Dr. Malcolm. Scott qualified from the University of Glasgow in UK. He has worked for almost 17 years as a Small Animal Vet with over 7 years experience in Dubai. He joined the practice in 2014. Scott has a busy family life, involving his wife, 2 children, 2 dogs, 2 cats and various other smaller members of the family. When not at work he enjoys reading and spending as much time with his family as he can. Chris has been a Vet since graduating from the University of Bristol in UK with a Bachelor's degree in Veterinary Science (BVSc) and a Bachelor's degree in Science in Biochemistry (BSc). He is a practicing member of the Royal College of Veterinary Surgeons (MRCVS) and currently lives and works in the sunny Emirate of Dubai, UAE. A skilled small animal first opinion general practitioner, he also has a wide experience across both medicine and surgery, including out-of-hours (OOH) and emergency practice. In addition to clinical interests, he has a passion for marketing and communication, actively engaging in and implementing effective marketing and PR campaigns for a number of clinics. This is in addition to his work as an author, publisher and advisor on vet careers and vet school applications (Vet School Success), and pet care app developer (Mucky Pup & Purrfect Paws). He was a Highly Commended runner-up in the 2011 Young Marketer of the Year Award, run by The Veterinary Marketing Association. When Chris is not writing his next book or geeking over some technological newbie he can be found leaping from perfectly good aeroplanes and helicopters in the name of adrenaline-fueled fun. He completed Ironman Lake Tahoe in 2015. Charlene graduated from the University of Sydney in Australia. She worked for some of the best hospitals in Sydney and Canberra prior to moving to Dubai. These hospitals believe in providing gold standard, human grade care for their patients. She believes in evidence based medicine. She strives to provide the most up to date diagnostic and therapeutic care. She has a special interest in internal medicine and enjoys managing complicated medical cases. She is also competent in managing second opinion cases. In 2017, Charlene was awarded her membership in Small Animal Internal Medicine from the Australian and New Zealand College of Veterinary Sciences with distinction. In 2018, she attained a certificate from the Veterinary Education Institute in Australia for the use of Fluid therapy in complex medical cases. Charlene believes that your pet is a big part of the family and having one should be an enjoyable experience. She understands that a vet visit can be an anxious time for some pets. Hence her gentle approach in a fear free and minimal stress environment is key to being able to provide the best care for your pet. Stephanie is from the tropical city of Cairns, Australia, and she moved to Dubai with her husband, her dog and her cat in 2016. She graduated from the University of Queensland in Australia with first class honors, and following graduation she completed a 1 year small animal internship at the UQ Small Animal Referral Hospital. For the following 3 years she worked at a small animal clinic in Cairns, and in 2016 she started working at Umm Suqeim Veterinary Centre. Her special interest areas are in small animal internal medicine, critical care and emergency. When she’s not working Stephanie loves surfing, playing hockey, traveling and photography. Sarah qualified from Massey University in New Zealand. She has worked for almost 7 years as a Small Animal Vet. She joined us in 2017 after working 4 years in New Zealand and 1 year in Doha, Qatar. Sarah lives locally with her husband Chris. She enjoys cycling, surfing, and travelling. Felicity studied Bachelor of Veterinary Medicine at the Royal Veterinary College. She previously worked in private practice in London and Hertfordshire. She joined the team in 2018. Felicity has a cross corgi rescue dog named Kokoni. She enjoys yoga, painting, and running. Milena graduated from the University of Parma in Italy. She participated in an internship in a referral center in the North of Italy. After this initial experience in her own country she moved to the UK and became a member of the RCVS in 2013. She worked as a Small Animal Veterinary Surgeon in North Wales then in South England, Christchurch for 3 years. She decided to move overseas and after a 3-month volunteering experience in an animal shelter in Thailand she moved to India and became the Head Vet in a modern new born veterinary hospital in busy Mumbai, the Indian financial capital. In 2018 she made the decision to move to Dubai and start working with the team. Milena loves nature, music, travelling, painting, yoga, outdoor sports and loves to explore, discover, keep learning and improving. Surfing and skateboarding is her newly discovered hobby. Kaiya studied Bachelor of Veterinary Nursing at the Royal Veterinary College in London and qualified in 2010. She worked as a locum in various clinics in the UK and full time in both first opinion practice and referral clinic/specialist hospital. She moved to Dubai in 2013 to join the team. She has a keen interest in both surgery and medical aspects of nursing. Kaiya has a 12 year old dog back in the UK and 2 ginger cats she rescued here in Dubai, O’Malley and O’Sally. She loves sport, in particular football and like to train TRX workouts and play Roller Derby on her skates. She also loves cinema, reading, and dancing. After graduating with a Degree in Animal Science in 2007, Hannah worked as a student Veterinary Nurse at Battersea Dogs and Cats Home in London. She completed her NVQ in Veterinary Nursing in 2010 and went on to locum in several practices across London and the Channel Islands. Between positions she volunteered with several charities overseas including Animal Asia Bear Rescue Centre in China and in shelters for stray dogs and cats in Thailand, Sri Lanka, and Borneo. She moved to Dubai to join the team in 2014. To unwind on her days off she likes to practice yoga, go stand up paddle boarding, and watch movies. Dawn started her animal career in horses and rode a winner under Jockey Club Rules in the UK. She qualified as a Veterinary Nurse in 2004 and has worked in mixed practice for 10 years. She enjoys surgical nursing and dentistry, but has self funded voluntary work through the WVS and helped with projects in Malawi, Brazil, and India. Dawn likes to get out and about and is a keen hill walker. Her goal is to summit Kilimanjaro, but since arriving here in August 2012 she has gone from running a 5k to completing her first half marathon in December. When at home, she works and trains her cocker spaniel Buidhe, and has a passion for photography and cooking. Allison graduated from Royal College of Veterinary Surgeons in UK. She qualified in 2003 and joined the RCVS register the following year. She has a diploma in Companion Animal Behaviour and Training (DipCABT) and a certificate in Small Animal Nutrition (CertSAN). She also completed her course in Pet Bereavement Counsellor (PBC), Royal Canin Pet Health Counsellor (PHC), and Companion Animal Dispensing qualification (C-SQP). Before joining the team in 2015, she worked with a wide variety of species from equine to lizards and focused on training student nurses. Allison likes to read in her spare time and loves to travel and explore the world. Ryan graduated with a Bachelor of Science in Veterinary Nursing from the University College Dublin, Ireland in 2015. He worked within the various specialized departments of the university hospital (UCD) for 2 years following qualification, with both small and large animal patients, while supervising and teaching veterinary medicine and nursing students. He moved to Dubai in July 2017 to join the team. Ryan is particularly interested in wound care. In his spare time, he enjoys photography, ice skating and travelling. Cristina is originally from Italy but lived in New Zealand for quite some years and graduated there with a Diploma in Veterinary Nursing in 2015. She worked in general practice (mixed practice) and then progressed to onto Emergency and Critical Care which is her big passion along with surgery. She moved to Dubai in April 2017 to join the team. She is currently completing a certificate in Emergency and Critical Care. In her spare time, she enjoys numerous activities but has a huge passion for Latin American dances. Marilyn joined the team as an experienced nurse in 2008 and studied while working to obtain her Australian Veterinary nursing qualification. She has an Advanced Award in Feline Behavior through Centre of Applied Pet Ethology (COAPE). She completed the Feline Nursing Diploma through the International Society of Feline Medicine in January 2019. After spending 2 years in Sweden she returned to Dubai and rejoined the lovely team in 2019. Marilyn love cats and has a passion for helping cats and their owners. She is especially interested in snuggling the golden oldies! She has two dogs and one very shy rescue cat called Misty. Following graduating with a degree in English Literature at Cardiff University, UK in 2012, Lucy decided to pursue her passion for animals and gained a Diploma in Veterinary Nursing in 2017. She has since worked as a night nurse for a busy emergency clinic, and joined us at USVC in October 2018. She is particularly interested in nursing medical patients and emergency work. Lucy has danced ballet over 20 years and continues to do so here in Dubai in her spare time. She also enjoys frequent video chats with her dog, Molly, who is at home in the UK and misses her dearly! Brigitta is an ambitious Hungarian Biologist who is eager to follow her dreams. Since she was a little girl she has had great interest in animals. In 2013, she graduated from the University of Eszterházy Károly in Hungary with a major in Biology. During her studies she worked as an intern at an Aquarium situated in Budapest and later was hired to work as a full time staff member. After gaining experience working at the Aquarium, she made a career change and decided to move to Dubai in 2015 and to work at a veterinary clinic. In February 2016, she joined the team as a Veterinary Nurse. When Brigitte is in Hungary she spends a lot of her time training and tending to her 3 yorkshire terriers. She enjoys scuba diving and you will often find her trying extreme sports during her free time. She also enjoys Salsa dancing and traveling. Lisa graduated with a degree in Animal Osteopathy from the European School of Osteopathy in France. She mainly worked with horses and realized her thesis on retired elephants from the tourism industry in 2018. She joined the practice in 2017 as the Head of Physiotherapy, taking care of Physiotherapy plans like post-operative care and weight management, bringing comfort to old dogs. Lisa is a former jumping horse rider and used to compete internationally. When not at work, she enjoys going to the beach. 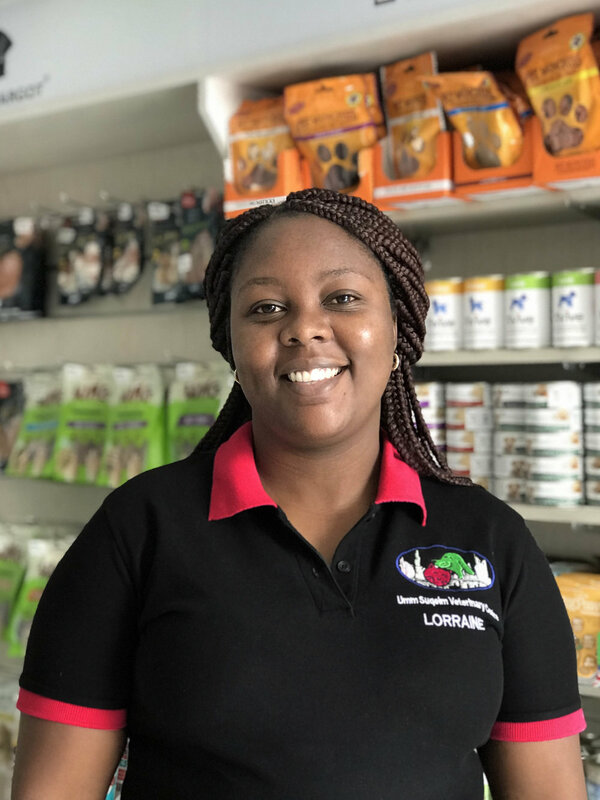 After graduating from High School in Dubai Naomi began her Veterinary Nursing career by volunteering at TEAR's in Cape Town SA. At Tear's her training involved the rescue and rehabilitation of neglected and abused animals before securing them a permanent home. This was a defining period in her decision to make animal welfare her chosen career. With the experience she gained during her time in South Africa she was able to accept internships at 2 veterinary clinics in Dubai. After completion of her internships she was offered a the position of Animal Handler where her duties involved the day to day care of animals in their own homes including administration of medication whenever necessary and daily exercise. 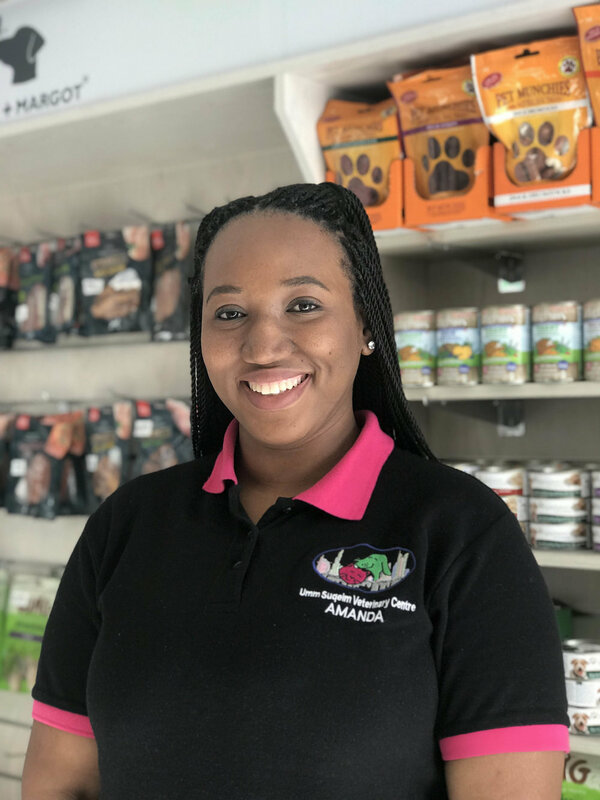 She looks forward to completing her qualifications as a Veterinary Nurse and continuing to specialize in the care of abused animals around the world. In her free time Naomi enjoys travelling, yoga, working out and listening to live music. She is the proud owner of 5 pets. 3 rescue dogs, 1 cat, and Molly her beloved Australian Shepard.